Last weekend was the first DobleIronManXabia event – yes a DOUBLE Iron Man, consisting of a 7.6km open water swim; 360km on the bike and 84km running – non-stop. An incredible challenge. And for me too. Not just that the event unfolds over 24 hours – but how to capture the various moods/vistas/stages whilst trying to get a portfolio of images for each competitor that would cover it all. I have shot triathlons and day long events before, but this would be something else completely – since the predicted spread between the first finishers and the last was about 8 hours. Knowing the area, in the weeks prior, I was thinking about possible vantage points that might offer good shooting opportunities – and during the week before the event I scoped a few of them out – after all, a cycling circuit of 180km (!) offers a few to choose from. For the running circuit (which would be in darkness) I also carried out a few test shots. I am happy with the results that I achieved – I hit some of my goals, not all – and I have learnt a lot about how to cover such an event successfully. I will take those learnings forward into future events. But I have to finish with a few words about the event itself and the incredible athletes that undertook the challenge. The swim started at 7am at the beautiful cove of Portitxol. Conditions were perfect for swimming, an almost pan flat sea and no wind. After wishing each other well and hugs all round they set off into the cold (for the Med!) water. The swimmers set off on the 7.6km swim in the DobleIronManXabia event. 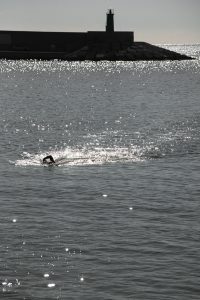 The swimmers approach Cap Prim during the swim leg of the DobleIronManXabia event. 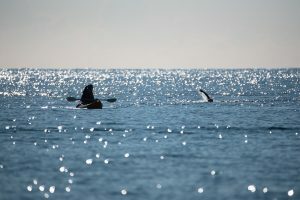 They swim around a headland and then into the Bay of Javea, crossing it to finish at the beach next to the Port. 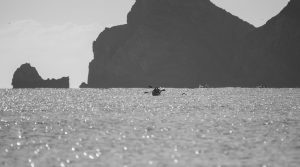 Each competitor was accompanied by a team member in kayak as well as a motor boat support. All but one of the competitors completed this stage. Iván Tejero Vázquez leads the field. Iván Tejero Vázquez nears the finish of the swim. After transition, they set off to complete 2 laps of an 180km loop that took them north, almost to Valencia. In the northern section, there was a bit of wind which added to the challenge. Oscar still loving life after 270km of the bike test! Iván Tejero Vázquez looking so comfortable after 270km. By now the competitors are quite spread out – there being a 6 hour difference between the fastest cyclist and the slowest – which means the difference between arriving at the transition at sunset and in the middle of the night. This is what adds to the challenge – it’s not just the long distances and energy expended, but the extended time factor – anyone after 18 hours of continual effort will be mightily taxed – but the difference psychologically between being half way around the running course at 18 hours and just getting off the bike and having to confront the prospect of a further 84km running – that is something else. And this is what I realised is the difference between a triathlon and a double Iron Man – the psychological impact is of a much greater magnitude. All of the competitors here are at a different level mentally. It was a real privilege to cover this event and to see them in action. Enhorabuena a todos los campeónes. This entry was posted in Event, Iron Man, Triathlon and tagged bike, ciclismo, correr, cycling, Iron Man, natacion, run, swim, triathlon, triatlon.